posted Jul 18, 2011, 10:36 AM by Becca K.
First of all, Natalie is appearing in Oliver! July 29 - 31 & August 5 – 7. She plays an orphan and a street urchin. The nice thing is that her flair for drama seems to be helping J The bad thing is, that all of the songs from the show stay lodged in my head – like the title of this post! Get your tickets at http://www.bctmagic.com/. I eat it when I am stressed out. I eat it when I am sad. We make it for funerals, in these parts, the women of the church providing their culinary talents to help take the pain away for a grieving family. And we make it when family and friends have new babies! It’s what we do to help. Make food. I honestly don’t remember my mom doing it though. But I do remember friends of our family’s bring over dish after glorious dish of food for my parents. There was the Ham and Scalloped Potato Au Gratin when my brother was born and the Ham and Wild Rice dish when my mom had knee surgery. My sister brought me Chicken Parmesan (or was it No Peak Chicken?) and a cherry cheesecake when I both lost a baby and Jason had knee surgery in the same week. It was a rough week…lots of food was eaten. And so this weekend I made food! I made Lasagna for our dear friends the Pearson family. They welcomed Aaron- Jeffrey Gabriel Pearson to their family on Wednesday! (All 8 pounds and 10 ounces of him!) Jason is the Godfather, truly an honor. So, I logged on to Facebook, just after finishing assembling the lasagna and found to my *gasp* horror that the Godmother (Erin) had already brought over lasagna the evening before. And we just can’t have that. My lasagna going up against someone else’s... What if mine was horrible? What if it was so terrible that Jason got removed from Godfather status? What then? So I whipped together (whipped is not really all together descriptive here – since it took a couple of hours) those famous Cinnamon Rolls of the Pioneer Woman (www.thepioneerwoman.com ). 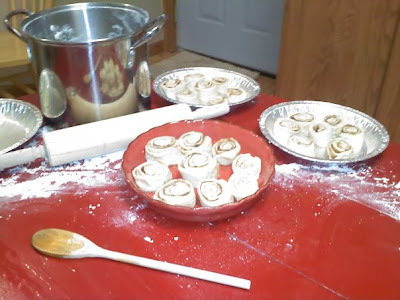 And as is the case with these Cinnamon Rolls, then all was right with the world. To comment – go to the guestbook and share your thoughts.